One of the toughest tasks after a loved one dies is knowing what to do with their things. How long do you hold on to their possessions? What feels right to one person, doesn't feel right to another. I know that when my dad died, my mom was very clear about not wanting to face a closet full of his clothes everyday. It just made her too sad. I also know of a woman whose son was killed in a car accident over 35 years ago, and she hasn't touched a thing in his room. There is no right or wrong way to go about this. It's a very personal decision. But I am so grateful to a friend of mine who did something for our family that helped us immensely in this regard. 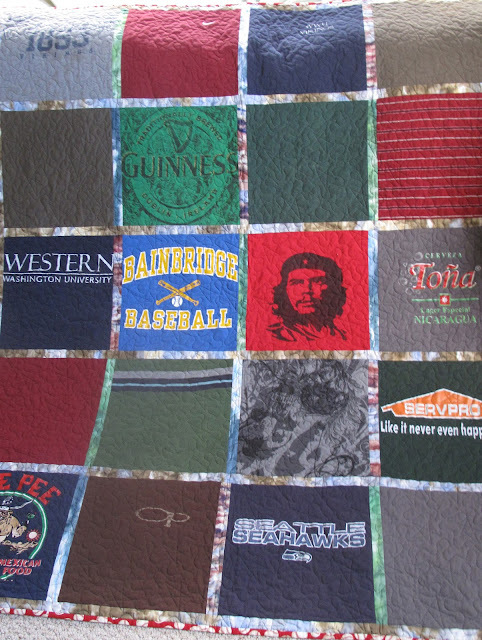 Peri Greenberg approached us a few months after Matthew died and asked if we would want her to make a quilt out of his shirts. She had seen a woman in her quilt group do this for a neighbor whose son died, and saw how touched the neighbor had been. We were incredibly moved by her offer and set about choosing the 20 t-shirts she requested. For anyone who knows 21-year-old boys, you know that t-shirts very much define them. So we sorted through them, and slowly put a pile together. We found the Che Guevara shirt he bought in Paris in 2007, and the Tona Beer shirt he bought off a street vendor in Nicaragua in 2009. There was a Western Washington University shirt, as well as a baseball shirt from his high school. Each t-shirt had a memory of Matthew wrapped up in it. Before I share the beautiful quilt with you, I want to share something that Peri told me when she was making the quilt. She said that she felt Matthew's presence while she worked on it. She said that when she was cutting up his shirts she felt a real sadness that stayed with her the whole time she was piecing it together. She was on the verge of tears most of the time while working on it, and she had never felt that before when working on other quilts of loved ones lost. The amazing thing was that once she got it back from the machine quilter and began to bind it in a baseball fabric, the feeling was much lighter. It was if something beautiful had come out of the sadness. She felt that maybe Matthew's spirit was with her and he saw what she was doing with his shirts. So last June, Peri, her daughter Hailee and our friend Lisa came over to the island to deliver the quilt. When she showed it to me, I was overwhelmed at the simple beauty of it. There were all of those familiar t-shirts and they gave me great comfort. I wrapped myself in it in the parking lot so Peri could get a picture. If you look closely at the edges, you will see that it's lined with a flannel pattern of baseballs, which is perfect for Matthew. The flannel makes it very comfortable to snuggle in (the perfect napping quilt). We are so grateful to Peri for this gesture of love. Her artistic eye and attention to detail has made this such a perfect way to remember Matthew. I know the experience well so this story of Peri and you touches me deeply. The blanket and the compassion, care and creativity that comes with it is stunning. What a kind gesture of love from Peri. Yes, you do know this experience too, Liz. I stand with you in solidarity and love. So much love, indeed, Margaret. You, of all people, know how it surounds us all the time. Miss you!! That quilt takes my breath away today, as it did when you first brought it over to show it to me. I remember thinking at the time that I couldn't bear to have any of Katie's best-loved clothes cut up, even to make a beautiful quilt out of them...but seeing it here, now, I think I'm ready. I would love to have a quilt like yours, made out of her favorite items. She loved her clothes, loved shopping, and it looks like such a comforting memento. Isn't it interesting how our feelings evolve over time? Her room still looks much as she left it. I have "edited" it, cleared space for our French exchange student and so on, but it still is "Katie's room," to me. I guess it will stay that way until something else shifts.